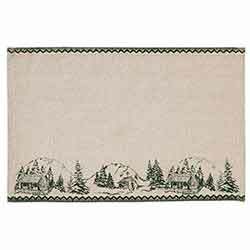 The Timberland Christmas Placemat Set captures a rustic setting from the Rocky Mountains over a chambray base. 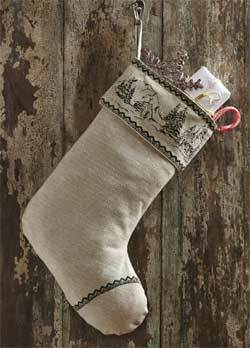 Timberland Christmas Stocking, by Nancy's Nook. Made of 100% cotton creme chambray, with green stenciled lace and "log cabin" image. Measures 11 x 15 inches. Timberland Christmas Table Runner, by Nancy's Nook for VHC Brands. 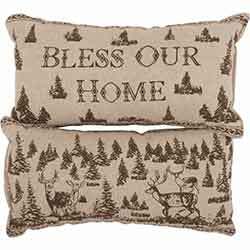 Made of 100% cotton creme chambray, and features green stenciled lace, and "log cabin" scene. Measures approx 13 x 48 inches. Tin Shelf Icicles, by Primitives by Kathy. Instantly add winter charm to your home by setting one of these metal shelf icles on a shelf or cabinet hutch! Made of galvanized tin, cut to icicle shapes, antiqued, lightly dusted with mica glitter. 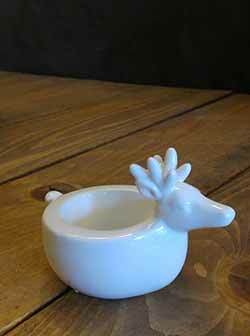 Measures 18 inches wide, 4 inches long, and 2.63 inches deep. 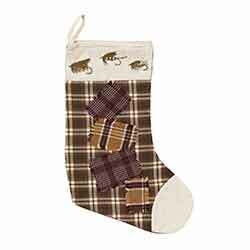 The Truman Stocking Fly will add a log cabin delight to any fisherman's retreat. Woodland Owl Embroidered Tea Towel, by Kay Dee Designs. 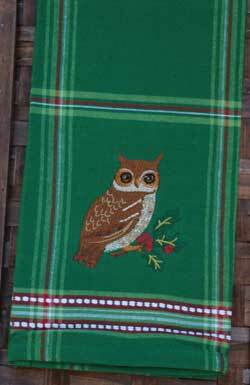 Woven cotton towel in a holiday green plaid, with a beautifully embroidered owl. Measures 18 x 28 inches. 100% cotton. Machine washable (see label for care instructions). Woodland Owl Gift Set, by Kay Dee Designs. 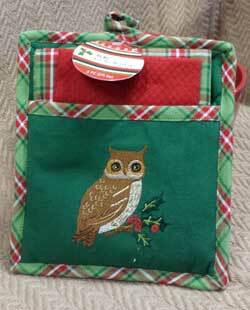 Pot holder in a holiday green with plaid trim, with a beautifully embroidered owl. Tucked into the pocket is a matching dishtowel and dish cloth. 100% cotton. Pot holder measures 8 x 9 inches. Towel is 18 x 28 inches. Dishcloth is 13 x 13 inches. Woodland Pinecone Gift Set, by Kay Dee Designs. 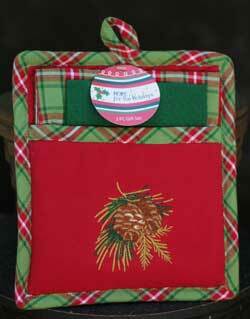 Pot holder in a holiday red with plaid trim, with a beautifully embroidered pinecone. Tucked into the pocket is a matching dishtowel and dish cloth. 100% cotton. Pot holder measures 8 x 9 inches. Towel is 18 x 28 inches. Dishcloth is 13 x 13 inches.